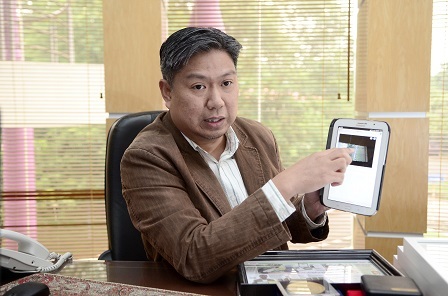 SERDANG, April 3 - An all-in-one innovation application , e-Site Inventory, has made it a breeze for data collection at project sites to be carried out compared to the use of conventional methods while the information gathered, to be more accurate. Based on a mobile phone application and using the latest telecommunication technologies, this intuitive e-Site Inventory can perform a variety of functions such as downloading of plans, image-taking with pixel sizes that can be limited, determining the position of x and y coordinates on earth surface, sketching of the images, and entering and storing of information or notes in systematic and organized manners. These user-friendly features have put an end to tedious works that need to be done each time data collection is carried out at project sites which all this while is done using conventional methods in the fields of designing, architecture, engineering and research. The conventional methods require all equipment such as cameras, plans, notebooks, GPS devices and measurement tapes to be taken along, making it difficult for professionals, surveyors and students to collect the data, and thus, the information collected may be inaccurate. 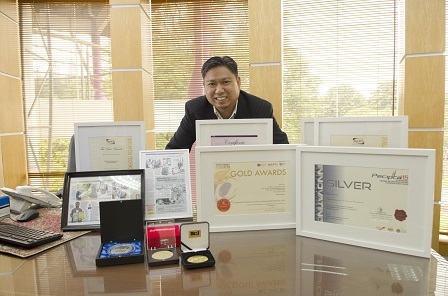 "The experiences that I have gone through and the difficulties endured by students who have to carry lots of bulky equipment triggered this idea of developing e-Site Inventory," said the man behind the innovation, Deputy Dean (Academic, International & Student Affairs), Faculty of Design and Architecture (FRSB), Universiti Putra Malaysia (UPM), Assoc. Prof. Gs. Dr. Mohd Johari Mohd Yusof. Together with Assoc. Prof. LAr. Dr. Osman Mohd Tahir and local ‘programmer’, Mohd Fakhrurrazi Mahmood, they started the research in 2014 and the innovation received its copyright in 2015. “Armed with just a mobile phone or tablet, work to collect the data was able to be carried out. This application can be uploaded via android play store,” said Dr. Mohd Johari. Besides coming to the rescue of students, this innovation, in a way, helps to safeguard the environment as students no longer have to use or carry papers to project sites since all information can be gathered and sketches can be done in the e-Site Inventory. He added that the e-Site Inventory version 1.0 application is also able to send all information collected at project sites through an e-mail facility built within the application and so, this ensures that they do not have to go back to the office and the data collected is taken from the actual site. According to him, the application inventory information stationery or internal inventory of buildings is widely available in the market but not special applications for collection works or site inventories which are still not available. "The combination of e-mail facility and other functionalities as well as limitations of the image sizes make this application unique - it has yet to be developed by any individuals or institutions,” he said. Recalling his problems when he first started on the innovation, Dr. Mohd Johari said initially he faced difficulties in looking for a ‘programmer’ that he had no choice but to blast his intention of finding a programmer via a WhatsApp group that comprised his primary school buddies of Sekolah Angkatan Tentera, Johor Bahru. "The due date was getting nearer. Through the WhatsApp, a friend suggested that I contacted Mohd Fakhrurrazi. Thanks to Allah, things went on smoothly after that,” he said. He said he is now in the stage of developing an e-Site Inventory version 2.0 which will be equipped with features of video recording, sketching using a variety of colors and measurement heights for trees and buildings.